Thanks to TMZ.com for the story. Ryan Sheckler — a world-class skateboarder who has also ventured into reality TV — had nearly $100k worth of jewelry stolen from his Las Vegas hotel room while he was snoozing, and the woman he planned on spending the night with has been arrested. According to the police report, obtained by TMZ, on February 27, Ryan was staying at the Palms Hotel and at 3:45 AM he took Stacy Salazar back to his room — a woman he says he’s known for 4 years. Ryan claims he fell asleep but was awakened by the sound of his door closing. He then noticed Stacy was no longer in his room. A few hours later he noticed his jewelry was missing — a Rolex watch valued at $12,500, a gold/diamond bracelet worth $14,975, a diamond and white gold ring ($63,275) and a diamond necklace of unknown value. Ryan called the cops, who took a report. The security camera shows Ryan and Stacy taking the elevator up to the room, and cops observed the Rolex on Ryan’s wrist. As for Stacy, the security camera shows her leaving Ryan’s room at 5:05 AM. According to the police report, “As she is walking she is fumbling with her purse that she carries over her shoulder.” She got to the elevator, wedged the door open at the last minute, got out, went to Ryan’s room where they spoke at the door for one minute, and then she left. Cops spoke with Stacy who claimed a childhood friend of Ryan’s was setting her up and that he was the real culprit. Apparently cops didn’t believe her, because she was arrested and booked for grand larceny. 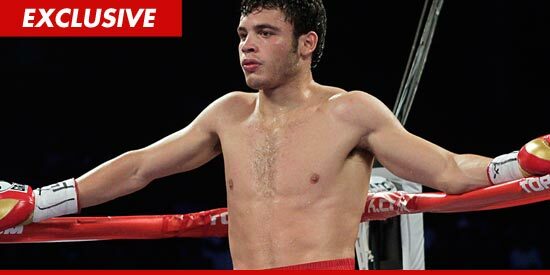 (Photo and story courtesy TMZ.com) Boxing champ Julio Cesar Chavez Jr. — son of the legendary Julio Cesar Chavez — will have to fight to stay out of jail … ’cause he was just charged with DUI stemming from an arrest earlier this year. TMZ has learned … the L.A. City Attorney has decided to hit Chavez with 3 misdemeanor charges … 2 for drunk driving and 1 for driving without a valid license. If convicted on all counts, JCC could face up to a year in county jail and a $1,000 fine. He’s due back in court to face the judge later this month. 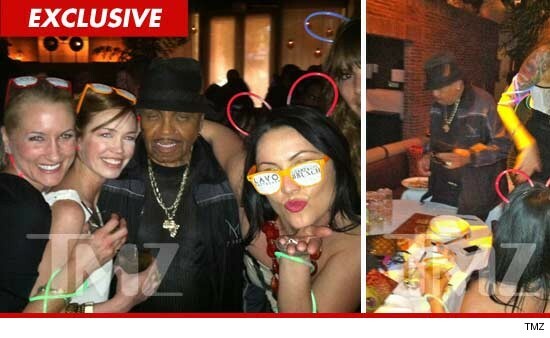 (Story and photo courtesy TMZ.com) 83-year-old Joe Jackson threw on his best track jacket … and goldest chain … and hit the club scene in Vegas this weekend … at 2 IN THE AFTERNOON. Michael Jackson’s father was chillin’ at Lavo Champagne Brunch at the Palazzo Hotel … a full-on nightclub-style party scene … that serves almond crusted French toast. Sources at the club tell TMZ … JJ arrived with a male friend … and wasn’t boozing, only drinking water. What happens in Vegas … is weird sometimes.